The purpose of this article is to serve as a general strategy guide with tips and advice that you should follow when attempting to win a quantity wing eating challenge. There are two basic types of wing eating challenges. 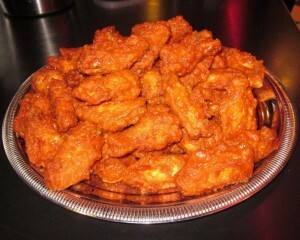 Some wing challenges require you to eat only 6 to 18 chicken wings, but they are covered with an extremely spicy sauce. That sauce usually contains Ghost Peppers, Trinidad Moruga Scorpion peppers, pure capsaicin, or some other type of really spicy pepper. The challenge is to be able to get through the intense heat and spice of the wings, rather than the quantity and size of the wings. While there are many extra spicy wing challenges around the world, there are also many quantity wing challenges, which this article focuses on. Quantity wing eating challenges typically involve anywhere from 50 to 75 chicken wings being eaten in one sitting. Almost all, if not all, quantity wing challenges have a maximum time limit, typically between 15 minutes and 1 hour, depending on the quantity and size of the wings, along with the prizes awarded. Quantity wing challenges typically involve non-spicy sauces and/or some hot sauces, but they are not nearly as spicy as Ghost Peppers and Trinidad Moruga Scorpion peppers. These challenges focus on whether or not the customer can eat the massive amount of chicken (and sometimes pork) meat within the particular time limit. Even though there are many different variations that you may encounter, the basic strategy that you need to have remains similar for every variation. Before we go into the specific strategy details for winning a quantity wing eating challenge, please make sure you have read and understand our Basic Strategy Guide For Winning A Food Challenge article. That article is full of 14 different basic strategy tips that will not be included in this article, which you also need to understand before attempting a quantity wing challenge. Please start off by watching our informative How To Win A Wing Eating Challenge video so that you can visually see all of our different tips put into practice during an actual quantity wing eating challenge. For this video, I attempted The 50 Inferno Wing Challenge at Philly’s Pizza in Marthasville, Missouri. In this challenge, there were 50 jumbo chicken wings smothered in Philly’s spiciest “Inferno” sauce which just included only a small amount of habanero peppers for flavoring. I had to eat all 50 wings in less than 1 hour to get the meal free and a shirt. 1. If you get to choose your sauce(s), pick multiple different flavors – For many quantity wing challenges, you don’t get an option to pick which sauce(s) you want on all of your wings. There is usually already a pre-selected sauce that you must eat, depending on what type of restaurant that is hosting the challenge. You may have to eat hot wings, BBQ wings, or whatever their most popular sauce happens to be. In the video above, I had to eat Philly’s “Inferno” sauce. If that is the case for your next wing challenge, then you must adjust and conquer. If you do get to choose which sauce(s) you want, then you need to take advantage of the opportunity and select sauce(s) that you know that you enjoy and can eat a lot of. The first thing that you need to do is to look at the menu and all of the sauce options that you can pick from. If you only get to choose one sauce for all of the wings, pick your favorite one that you know you will enjoy. If you are debating between two or 3 choices, ask if you can sample them, and then choose. For me, I usually pick hot wings (with Frank’s Red Hot Sauce) because I can eat a lot of them and I still enjoy the taste after eating 30 or more. If you can only choose one, avoid sauces that are extra sweet or extra filling. A sweet or filling sauce may be good on the first 20 wings, but can you eat 30 more of them? If you get to choose multiple sauces, you would be smart to pick a few different options so that you can continue switching up the flavor on your taste buds so that the food remains enjoyable. In this case, picking a sweet sauce is not as big of a deal. Take this sauce decision seriously because it has a major effect on your challenge experience and outcome. You don’t want to eat 50 jumbo wings that you don’t like!! 2. Let the wings cool down before beginning – The bold print is self explanatory and obvious, but I have heard of many people burning their tongue and mouth during a wing challenge because the temperature of the wings was too hot. If this happens, it is nobody’s fault other than your own. Restaurants fry the wings, let them sit for a minute or two so that the oil drips off, and then they dump them into the big bowl or dish and smother them with sauce. Usually, they are then served immediately to your table and placed in front of you because the restaurant knows that the wings will be cooled off by the time you are done eating them. As you saw in the video above, the wings I had to eat were extremely hot when served to me, and you could see all the steam rising off of them. WAIT for the wings to cool off a little before beginning, especially if the time does not begin until you take your first bite. Don’t begin when everyone wants you to start. Feel the wings with your hands and see how hot they are, and then feel the ones that are on the bottom still soaking in all of the sauce. If the sauce is still almost boiling hot, then all the wings sitting in it are extra hot too. Don’t let them cool off too long, but don’t start too early either. If you do, you will burn your tongue and mouth which will hurt for the remainder of your challenge. You will also have to drink extra liquids to reduce the intensity of the heat which takes up stomach space. 3. Eat the wings and drums with the most meat first – One of the reasons that you want to eat the meat first during burger, hot dog, and other food challenges is because the meat typically makes up a large percentage of the weight of the challenge. Once you get the meat down, a majority of the challenge is complete so you will feel much more confident mentally about finishing the rest. It is like finishing the first 40 miles of a 50 mile bicycle race, and knowing there are only 10 miles left to finish. Following the same principle, you should select the largest and most “meaty” wings and eat them first. Get all of the large ones out of the way first in the beginning while you are fresh, and save the skinny and easy ones until the end when you are full and don’t want to eat any more. I have tried both ways, the other method being to eat the skinny and easy ones first while saving the big ones for last, and I definitely feel that getting the large ones done first is a better strategy. Don’t just start grabbing wings and eating them. Have a strategy and purpose behind your actions and techniques. 4. If the wings are spicy, prepare yourself mentally beforehand – I will be the first to say that I am not a huge fan of extra spicy foods, but I have eaten some spicy things made with ghost peppers and habaneros that were very bearable and actually ended up tasting pretty good. I can eat the Blazin’ Wings at Buffalo Wild Wings very easily with no problems, and I don’t even require a drink afterwards. There have been times though where I bit into something, not knowing that there was a raw jalapeno or other spicy pepper included, and I started freaking out, sweating, and running for water or whatever cold liquid was closest. The reason for the difference is that I was mentally prepared for the heat of the extra spicy foods, but was completely “thrown off guard” by the heat of the jalapeno, a less spicy pepper than the others. If your quantity wing challenge involves a sauce that is pretty spicy, make sure that you show up mentally prepared and ready to take on the heat. Like I said in my video, the wings were pretty spicy, but I knew that before beginning and I was prepared to eat them. If you are not ready for the heat, you most likely won’t finish many of the wings and you will fail your challenge. It is that simple. 5. Eating the drumsticks – There are multiple methods that people use to eat the drumsticks, such as sticking the whole drum in your mouth and pulling it out while using your teeth to clean all the meat off the bone, but I’ve found that the most simple and effective way to eat the drumsticks is by eating it just like you would eat corn on the cob. Some people call it the “typewriter” method. Twirl the horizontal drum stick while taking two or three bites to clean the bone, and then swallow while throwing the clean bone in the “bone yard” (separate tray or bucket for finished wings). This is the best way to enjoy the wings too while still eating them very quickly. 6. Do NOT waste any of the chicken meat. Leave NO doubt!! – I have seen pictures and posts from other eaters in the past about them being upset that they had failed a wing challenge because the owner said the wings were not clean enough after time had already expired. As mentioned in Are Food Challenges Wasteful?, I absolutely hate wasting food, and it is definitely one of my pet peeves. I am not afraid to eat untouched food off of a stranger’s plate that is about to be wasted and thrown away. It takes a lot of slaughtered chickens to make 50 wings or however many wings you have to eat for your challenge, so make sure to eat ALL of the chicken meat off of the bones. The biggest reason that you need to do this, to not only avoid wasting food, is because you don’t know how strict the person will be who reviews your wings after the challenge is complete. If you finish your final wing with only three minutes remaining in the challenge, and the restaurant owner says that you still have to many unclean bones, you most likely won’t be able to finish them all and sort through all the bones in only three minutes. Time will expire, and then you will have to disappointingly bust out your wallet to pay for the meal. You can easily avoid this issue by eating all of the meat before tossing the remains into the bone yard. 7. Eating the chicken wings – There are two very popular methods for eating the actual chicken wings (flats). You can use your thumb and fingers to push all the meat down to one end of the wing, and then eat it the meat, but there is a less messy and more efficient way. Grab the bottom of the wing with both hands, separate the two bones attached to each other, put the entire wing in your mouth, and then use your tongue and teeth to scrape all of the meat off the bones while you pull each bone out of your mouth at a 45 degree angle. By doing this, you will scrape almost all of the meat off the bones so that you can swallow the meat while throwing the bones in the bone yard. This method works especially great when the wings are cooked so that the meat falls easily off the bone. Wings vary between almost every restaurant that serves them, so how easily the meat comes off the bones will just depend on the skill level of your eating technique and the quality of the wings being served. 8. Use sauces to change up the flavor along with drinks if necessary – Especially if you have to eat 50 or more wings with the same sauce on all of them, you may eventually begin to suffer from flavor fatigue and get tired of the taste of the wings. We teach that you should use drinks and liquids to help switch up the flavor towards the end of almost all food challenges, but using sauces to change up the flavor is common during wing eating challenges because ranch and blue cheese dressing are typically served with wings when you order them as appetizers, especially in the USA. If you were able to pick multiple sauce flavors, you may not need to use this strategy tip, but feel free to dip a wing or two (or more) into your favorite sauce if it will help you enjoy the food more so that you can finish all of the wings and win the challenge. You may want to ask the restaurant which sauces are available before you begin the challenge, just so that you can think about what you will want to order later on. This will also help you feel more confident and relaxed mentally because you will know that you won’t have to worry about getting tired of the flavor, making you more prone to getting “sick” and disqualified. 9. Use milk and fatty dairy products while eating spicy wings if the rules allow it – This is covered in much more detail in our How To Win A Spicy Wing Challenge article, but I wanted to address it here too. If you are not a “chili head” that loves spicy food, and you are attempting a wing challenge with a really spicy sauce that includes peppers like habaneros (there are no quantity ghost wing challenges), you may want to drink milk or use some other type of fatty, cold dairy product when necessary to help you finish all of the wings. Besides milk, you can use regular sour cream, and even non-dairy sauces like ranch and blue cheese. Eating ice cream and drinking a milkshake may be frowned upon during the challenge, but you may want those afterwards!! They will burn, just like the wings I had to eat in the video above, so you need to make sure you are ready to combat the intense heat and pain. When you call ahead to Confirm The Details With The Restaurant, ask whether or not you are allowed to drink milk during the challenge. If you are, you may want to bring your own so that you save money and guarantee that you have enough milk during the entire challenge. The fattier the milk, the better it will combat the spiciness, so drinking whole milk is most recommended. Like with all challenges though, DO NOT drink so much milk that you fill your stomach up with milk and cannot fit the last few wings. Your best strategy is to just have the milk on hand, and only use it if the pain becomes close to unbearable. Having the milk and ice cream there will help keep you relaxed and confident, knowing that those will be ready for you after you dominate the challenge. You can do it!! For most people during a quantity wing challenge, this will never even become an issue, but every person is unique with different pain tolerances, so I wanted to address it. If you combine the tips above with the Basic Strategy Tips For Winning A Food Challenge, you have all the major advice that you need to plan the strategy you will use to dominate your next quantity wing eating challenge. To go back and view other Strategies Per Challenge Type articles, click here.